Above lor arh (braised duck) stall is currently selling at Queen Street Food Centre. On the left hand corner of the photo is a picture of a pushcart and written on the attap roof four Chinese characters (六十年代) meaning the stall has been in lor arh (braised duck) business for 60 years. I was disappointed when the stallholder answered me that he was not aware of the 'si go luck' dice game that accompanied the lor arh business before. He did not look very old, so I assumed that 60 years ago, his father was the hawker and not him. Today's gourmet has to travel to a food centre or an eating house to eat lor arh or braised duck. In the 50s and 60s the reverse was true. The itinerant lor arh hawker would come to your door announcing his braised duck "lor arh, lor arh!". Recently, a fellow blogger Jame Seah and I had the opportunity to act a lor arh hawker and his customer as in the old days, for a tv documentry on Heritage Food. The scene acted out was nostalgic and unique because only the lor arh hawker would play a game of dice with his customer, giving him a chance to win the braised duck instead of buying directly from him. Sound, Lighting, Camera & Action! Above picture shows only the main stuff - braised duck, egss and dices in a bowl for the game. Three dices are used. The customer throws the dices first into a bowl and let them roll. The dices must resulted in a paired number (say two 3s) and a single/challenged number (say 4). When there is no paired conbination, the player must continue to play the dices until there is a result. If the 3 dices show number 1, 2 and 3, or a pair with the challenged number 1, the customer loses outright. That is the odd against him. If he wins the first round, he has to continue playing until he wins the best of 3 games to claim his prize of 3 eggs. He could return the 3 eggs to play for a quarter duck, and then to half a duck and finally the whole duck. For each bet he must win the best of 3 games. The basic price per game was 30 cents for the prize of 3 eggs. A customer could pay more to play for a quarter duck instead of starting with the basic 30 cents for 3 eggs. Fast rewind back to the 50s and 60s at Joo Chiat. Every Sunday my home was like a club house. My friends, mostly shopkeepers in the vicinity gathered to drink beer, hard liquor and played mahjong and cards. That was where I learned all the vices as a teenager. The itinerant braised duck hawker usually arrived at my house about lunch time. His mobile stall had lor nun (eggs) and lor arh (braised ducks), plus gizzards etc. He gave free sauce(lor), cucumber and chilly sauce. Many of us took turn to play against him until somebody won a whole duck or two and some eggs. Unlike today's hawker stall where you can buy a bowl of rice or porridge, this guy had no rice at his stall. Anyway, no rice was fine with us drinkers. I remembered there was one or two occasions we won all his ducks, eggs and all. He did not mind at all for we lost to him a sum of money which could be more than the cost of his goods. The players had the satisfaction of winning the briased ducks and the hawker was happy to make more money by playing the game of dice. It was a win win situation for both. No wonder it was so popular in those days. Hey Philip. How can you forget to mention the contribution of the film critic who pointed out that our lead actor did not look very authentic because his singlet was so white and clean; and some more did not have any holes in it. 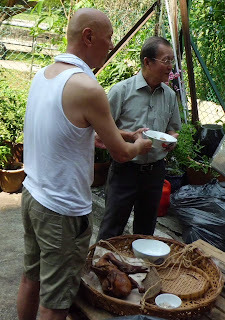 In our kampong,we too had a lor ark seller who came in a motor bike. He was from another village. My mum liked to buy his lor ark. His chilli was very nice. My Lor Arh hawker's singlet had no holes. Might be yours was poorer lah! 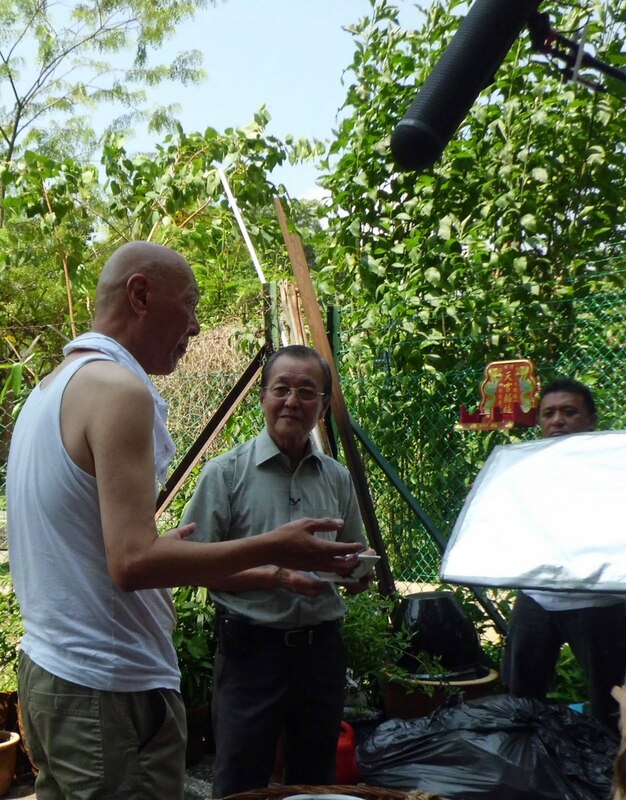 Yes, yes Philip we mustn't forget our film critic and consultant Brother Lam Chun See, SIP Producer/Director Thinker/Doer Sok Kiak with Team Co-ordinator Catherine Lim, the production crew and everyone to make the heritage food documentary on TV possible. Thanks to everyone. Thanks to Chun See for his sharp observation to details and spotted the hawker's spot and clean singlet with no wear and tear for an "authentic" presentation. Philip, appreciate for the preview on the heritage food blog which a friend has learnt the rule of the "lor arh dices game" from your description which his father once played the game four decades ago but never told him. Now he knows! Singlet got holes or no holes does not matter very much...you guys have done well! It's never an easy thing to try to recreate an authentic scene with limited resources available. James looks so cool in his outfit..from the pics. A post which really brought back my memories. I had lived in Lorong 15, Geylang, in the 60s. I remembered there was this man wearing an old trishaw hat, a street hawker selling lor arh and stuff, coming to my father's shop's five-foot way around 2-4pm. I cannot remember much about the 'arh', as children did not have much chance to savour such expensive items. I strongly remember the taste of the fishball (served on short satay sticks when not buying any duck meat), which was fishy, very fishy, but delicious. The other fond memory was the chilli sauce. It had an extremely strong garlic flavour. It was so strong that it left on me a deep impression for over 40 years. Hi Peter, I was told your mother was very good at playing dice game and often won the whole duck. If she is still around I could get more details from her about the lor arh hawker. I forgot that the hawker had fish balls and the chilly sauce had strong garlic smell. Thanks for the memories. Almost all the itinerant hawkers whom I had met and that's a lot of them...do not have "holes" in their singlets,shirts or dresses. A dirty-looking, ragged-looking hawker does not attract customers...even in the past. They may be hawkers but also had self-esteem.Some even wore proper hats that added to their image. The 'lang ting tang ' apek who plied his trade and talent alone by entertaining while strolling through my kampong..is an excellent example. He usually wore a blue tunic, with 1930 hat on his head and proper socks and shoes. He was someone, as kids, we would all rushed out to see and listen to when we caught the intoxicating strains of his music from afar. Thanks PChew for the tip. Will struggle to the Lor Arh for a meal one of these days. Dicko, isn't 'lang ting tan' apek a fortune teller? At my place he appeared at night only. He had a guitar like musical instrument at the tip of which he hung an oil lamp. Around the lamp were sticks of 'çheam si'. The customer picked one stick with Chinese characters on it. The apek interpreted the 'cheam si'by singing a song related to it.